The Lady Bulldog basketball team came up short of its goal of a weekend sweep Saturday but came away from a 59-47 loss to Albuquerque Academy with some solid experience against a quality Class 5A opponent. The Lady ‘Dogs trailed the Lady Chargers by six heading out of the first quarter of play, 18-12, and were unable to keep pace with Academy again in the second. The girls in red outscored Artesia 17-11 in the period to lead 35-23 at the break. The Lady Bulldogs were just two points short of the Chargers in the third, 11-9, and outscored Academy 15-13 in the final eight minutes, but the damage had unfortunately been done. “The girls gave a really good effort,” Houghtaling said. “They executed really well, and I was really pleased with the way we were able to get some offense against their good man-to-man. 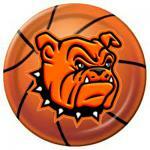 The Lady ‘Dogs (10-5) will head to Carlsbad Tuesday for their third meeting of the season with the Class 6A Cavegirls at 5:30 p.m. preceding the boys’ game at 7 p.m.
Artesia fell to Carlsbad in the City of Champions Classic title game Dec. 10, 54-17, and came up short of the Cavegirls Dec. 20 at Bulldog Pit, 45-24. “Carlsbad is a great team, but we’re going to play hard and do our best to work on some stuff we feel like we need to work on for district,” Houghtaling said. “I’m excited to play them. It’s a great environment. You know the gym will be full, it’s always real rowdy in there, and it’s a really fun place to play and coach, so we’re looking forward to that. The Lady Bulldogs, comfortable on their home court before a sizable Homecoming crowd, put on a clinic from beyond the arc Friday against Santa Teresa, draining 12 longballs amidst topping the Lady Desert Warriors by a final of 64-26. 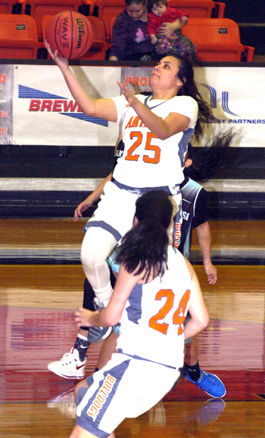 The Artesia girls were able to build a comfortable advantage by the break, 27-15, and rode a three-point shooting contest between Kyrah Gonzales and Alexa Riggs to a second-half runaway, shooting 41 percent from the field on the night. “It was a good shooting night for us,” head coach Jeff Houghtaling said. “We came out and really shot with a lot of confidence and really played loose – not too loose, just confident loose. We were real confident in our game plan, we hit a lot of shots, and you know how it goes – when a couple of girls start hitting shots, pretty soon everybody thinks they can hit one, and they start going in. After falling behind 5-0 in the early goings of the opening quarter, Gonzales’ first of six treys on the evening propelled the Lady ‘Dogs into the lead. Artesia would close out the first on a 8-2 run to double up on Santa Teresa by period’s end, 14-7. Elisa Cardenas kicked off the second with a three, but the Warriors were able to inch back within four, 17-13, midway through on a pair of shots in the paint by Brianna Barreras and a Dianne Hefner jumper. Three of four from the free-throw line and an offensive putback by Gracie Puentes, a Stacia Martinez layup off the steal, and a Gonzales trey, however, put Artesia firmly in control at the half, 27-15. Kali Crandall put a pair off the glass to open the third before Riggs went on a tear, notching a trio of three-pointers in the span of just over a minute to help bump the Lady Bulldogs’ lead to 23, 45-22. Three more long-range shots by Gonzales and one apiece from Riggs and Karie Bratcher in the fourth slammed the lid shut as the Lady ‘Dogs set the mercy-rule clock in motion in the final two minutes of play en route to their 38-point win. Gonzales led all scorers on the night with 20 points, followed by Riggs with 12. Hefner finished with 12 for Santa T.